Tinco Lycklama à Nijeholt was born on a Sunday, 9 July 1837, at the home of his parents at Beetsterzwaag, in Frisia. Today, he celebrates his 29th birthday far away from his family. He is currently living in the lush Tajrish area, north of Tehran. His neighbour is Amedée Querry, chancellor of the French legation to Persia. In Tajrish, many foreign diplomats chose to live to escape the suffocating summer heat of Tehran. Given that Tinco enjoyed socializing, balls, and music and dance performances, one would assume that he must throw a party today at his Tajrish home. Well, we currently don’t know. In fact, little is known (yet) about what he did exactly during his first 5-month stay in the Qajar Persian capital. So, unfortunately, we can’t say anything about how he spent his birthday. On the other hand, we know exactly what he did on the three other birthdays that he celebrated during his travels of 1865-1868. So, because of the lack of precision on Tehran, we use this occasion to say a few words about his birthdays in Moscow (Russia), Hamadan (Persia), and the deserts near Palmyra (Syria). Having said that, we hope that Tinco enjoys our present: a little collection of contemporanean photography about Tehran and Persia on Pinterest. Tinco arrived in Moscow on July 5th, 1865. He stayed five days visiting the city and, the day before his departure (which was July 10th) he made a short trip to Sparrow Hill (“la montagne des moineaux”). According to Tinco, visiting this hilltop was a must for any visitor, as it gave you the most magnicificent view of Moscow. Tinco also wanted to see the exact places that saw Napoleon’s withdrawal from Moscow on October 19, 1812 – after looting the city and before setting it on fire. Tinco takes the road to Sparrow Hill from Kaluga Gate – which is where Napoleon’s troops left the city that day. Thirty-five days before, Napoleon and his troops first laid eyes on the still-intact city from Sparrow Hill. Now, from the same hill, Napoleon looked at the devastated city he left behind. Tinco briefly reflects on these events. He had an instant liking for the city and preferred it over Saint Petersburg, despite the latter’s grandeur and more modern architecture. One can only guess at Tinco’s feelings celebrating his birthday on Sparrow Hill. On this birthday, Tinco was in Hamadan – the city at the ancient site of Ectabana, once the capital of the Parthes and today a major city in Iran. 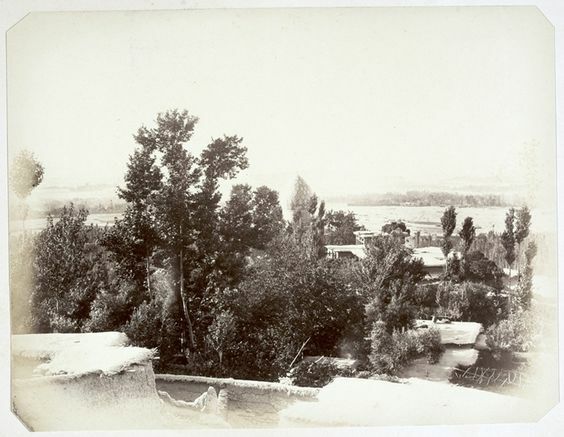 Tinco met a number of interesting people at Hamadan, such as governor Abdosamad Mirza, Ezz ed Dowleh (1843-1929) – a brother of Naser al-Din Shah – with whom Tinco became instant friends and who visited Tinco in Cannes, in 1873. However, this encounter only takes place a few days after this birthday. Tinco spends his birthday in the company of Mahmud Khan, former Persian ambassador to Saint Petersburg and London. He had met Mahmud Khan and his brother Amman Ali Khan previously in Tehran, in the summer of 1866 – at the home of Charles Alison, the British minister plenipotentiary. These were very influential men in Persia, even though they were not members of the Qajar dynasty but rather of the Qaraguzlu (Kara guzlou) tribe. Both tribes were transplanted at the same time centuries before from Syrian regions to Persia. The privileged position of the Qaraguzlu was owed to Naser al-Din’s father who had bestowed the rule over the Hamadan province to this tribe (though the Qajar princes maintained the nominal governorship). The day of his birthday, Tinco was invited to Mahmud Khan’s impressive fortress and palace at Sheverin (Chavari), just outside Hamadan. In the company of Mahmoud Khan’s family, Tinco enjoyed dinner and music, as well as the excellent companionship of Mahmud Khan himself, who was fluent in English and French. Mahmud Khan had spent many years in Europe and, despite being a traditional Persian at heart, he was a protagonist for European-style modernization of the country. You could call this a pretty exciting and adventurous birthday. On July 4th, Tinco Lycklama was in the city of Homs (in current Syria). It was the famous Algerian military and politician Abd el-Kader (exiled in Beirut) who told Tinco to travel to Homs and meet with Jane Digby. As she was married to Sheik Abdul Mijwal al-Musrab, the leader of a powerful bedouin tribe, she was best placed to arrange protection for Tinco in the pursuit of his dream to visit the ancient site of Palmyra. Everybody had told Tinco it was impossible to reach Palmyra given the strife between rivalling tribes in the desert. But, Tinco was stubborn… and did it. Thus, Tinco left Homs on July 6th and headed for the Sheik’s desert encampment. Given the turbulence in the desert, he only left on the 13th and reached Palmyra the 15th, escorted by 120 riders. Tinco paid a 1,500 francs for the effort (which probably amounts to around 7,000 euro today). It was the Sheik’s own brother, Yussuf, who took command. But, on the day of his birthday, Tinco stayed in the safety of the encampment, in tents next to the Sheik himself. surrounded with a small army of over 5,000 men. On the day of the 9th, groups of riders drove out into the desert to observe the movements of rival tribes and got into occasional skirmishes. Before his departure for Palmyra, Tinco actually observed outright desert battles between the Sheik’s troops and tribes from the Hauran region. Tinco was happy with life in the encampment. The food was basic, the comfort spartian. But il allowed him to observe for many days how life was in the desert. He was far away from his family, but at age 31 this would be an experience of a lifetime.